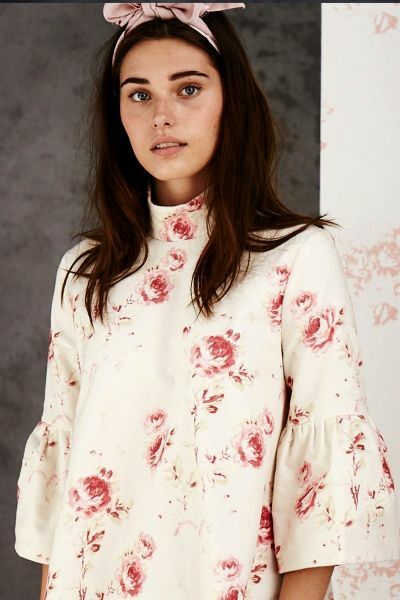 Made from a Cabbages & Roses faded rose print on a cotton velvet with a very slight stretch, the Christoff blouse is a charming high necked short blouse, fitted at the shoulder and flaring out into an elegant A line shape to the waist. With fitted sleeves culminating in a deep gathered frill, the Christoff top is a C&R classic which is ultimately flattering, extravagant and practical. The Rosie velvet Christoff top is both comfortable and flattering. Fitted at the shoulders with buttons down the centre back, the top flares into a gentle A line shape. 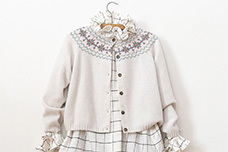 The sleeves are gently pleated with a gathered frill which ends just above the wrist. The hem ends not too high and not too low. The model is a size 10 and is 5 foot 7. 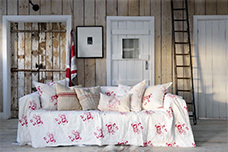 Rosie velvet is a new Cabbages & Roses design, it is made by our lovely printers in Brighton. Caring for Christoff. 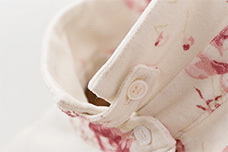 Rosie Christoff is machine washable, the cotton velvet is washed in its printing process at high temperatures. We would recommend washing at 30° using Ecover delicate laundry liquid. If you do not tumble dry, it saves electricity and your clothes last longer. You can also dry clean Christoff, if you must, with an ecologically friendly dry cleaner. Do not bleach. Cool iron and cool tumble dry.